After the death of his parents, Jim is sent to live with his grandparents on the Nebraska plains. By chance on that same train is a bright-eyed girl, Antonia, who will become his neighbor and lifelong friend. Her family has emigrated from Bohemia to start a new life farming but soon lose their money and must work hard just to survive. Through it all, Antonia retains her natural pride and free spirit. Jim's grandparents have a large and tidy farm. They are kind to him, but conventional. Later Jim becomes a scholar and Antonia becomes a 'hired girl' in town. She blossoms in the new freedom that town life offers. Jim can only taste this life vicariously through her recounting of town gossip and of the 'dance tent'. 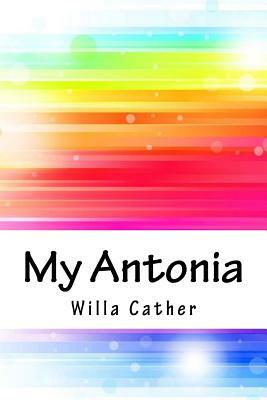 Antonia's strong will, spirit, and honesty allow her to thrive in the midst of hardship. Cather paints a rich picture of life on the prairie at the beginning of the twentieth century and depicts some of the many cultures that came to comprise the United States.